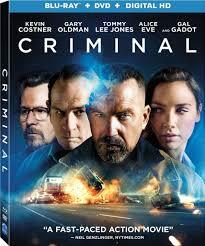 We have one brand-new copy of CRIMINAL starring Kevin Costner to give-away. This film looks to have one all-star studded cast! Tommy Lee Jones, Gary Oldman, Gal Gadot, and Alive Eve. All you have to do is sound off below on you think has had a better acting career and why! Kevin Costner or Tommy Lee Jones? CRIMINAL hits stores everywhere on July 26th, and is available now for pre-order. From the standpoint of leading roles Kevin Costner would have to win this discussion, however it’s my opinion that Tommy Lee Jones is more memorable in the roles that he has played. Costner is a talented actor but his personality is so low key and serious that he tends to blend in to the films. In one of his strongest roles (Field of Dreams) I was more intrigued by the ball players than by his character. His co-stars seem to strengthen his characters rather than him being the main acting force in his films. Dances With Wolves is really the only film (that I’ve seen him in) he really takes on a strong presence. Tommy Lee Jones, on the other hand, seems to “own” the screen whenever he shows up to deliver his deadpan lines. Despite being a “supporting” actor in many of his films, his scenes seem to add considerable strength to the overall story. In Blown Away, the scene I remember most is when Jones is assembling his bomb on the rusted out ship while U2 is playing on the radio. It’s the same thing in JFK. Costner may have been the lead actor, but Jones’ Clay Shaw is a much more interesting character in the film. And Will Jones wouldn’t have been nearly as funny in Men In Black if it hadn’t been for Jones’ cranky personality. Costner may be a talented actor (especially in the late 1980s and early 1990s), but Tommy Lee Jones wins my vote for the actor that has contributed more to the film industry during his overall career. Tommy Lee Jones!!! Great acting in No Country for Old Men and the faintly known Gem of The Three Burials of Melquiado Estrada plus many more!! Tommy Lee Jones has a much more even and prosperous acting career. He’s well regarded and I don’t think any of his movies are considered flops. Kevin Costner has had a number of hits, but movies like Waterworld and The Postman (mediocre movies, even if they have some great ideas) tarnish his acting career. Kevin Costner and Tommy Lee Jones are both excellent actors. And they each have had a successful acting career. And both of them have turned in some excellent movies over the years. But in my opinion, I think Tommy Lee Jones has had more of a consistent string of hit movies (and more of them) than Kevin Costner. Also, it’s worth mentioning that Tommy Lee Jones has been in the business longer than Costner by 11 years. So it will be hard at this point for Costner to rival Tommy’s success on the whole. Tommy lee is an amazing actor as well KC. I didn’t see this in theaters but am planning on buying this movie once it comes out.Tommy has had to play several different characters. KC as I refer to him…Has had many challenging charters as well. But KC diose a great job. Tommy Lee Jones for sure, simply because his movies are the ones that I actually watch. The Fugitive, MIB, US Marshals, Man of the House, No Country, Criminal and now Jason Bourne. Costner has some big movies–just not the movies that I was into growing up. Neither! Gary Oldman! Just kidding. But between Tommy Lee Jones and Kevin Costner, I would have to go with Kevin Costner. I know that Tommy Lee Jones has been nominated for awards more and is still very deserving. And I absolutely love his performance in just about everything that he has done. But he, for the most part, plays the same character or plays different characters the same way over and over throughout his career. Kevin Costner seems more willing to take risks and try different things. He does not always succeed, but he is more daring. And he had quite a run from 1985 -1994 with the following films: Silverado, American Flyers (underrated), The Untouchables, No Way Out (severely underrated), Bull Durham, Field of Dreams (my all-time favorite movie), Dances with Wolves, Robin Hood: Prince of Thieves, JFK, The Bodyguard, A Perfect World (criminally underrated; double wink-wink 😉 😉 ), and Wyatt Earp. For me, Costner wins this battle. I respectfully disagree that Costner has tried more different characters than Jones. He almost always plays a quiet, low-key, serious character – and as I pointed out in my original post, he tends to blend into the films which is why some of those films that you mentioned ARE underrated. I loved some of the movies that you mentioned (and I agree that Field Of Dreams is a GREAT flick – but not really because of Costner). I give Costner kudos for Dances With Wolves, but many of his other roles could have been played by hundreds of different actors with the same results. It’s true that Jones tends to be typecast in movies, but I would challenge you to come up with two memorable lines that Costner is credited with while, in comparison, I can think of at least half dozen great lines that Jones contributed to making his films better than they might have been. Do you challenge me to come up with memorable lines that he ad-libbed or for which he is known? Because if you want ad-libbed lines, it is highly debatable whether or not a line was scripted or not. Oftentimes, an actor is credited with ad-libbing something that the director added moments before a scene is shot. And let’s not forget that great lines must originate from great writing. Most of the time, a line is remembered because an actor delivered it just the right way. Tommy Lee Jones is very good at delivering lines, but so is Kevin Costner. And why must something like ‘lines for which an actor is known’ define his/her career? Any way you want it, here are some lines that Kevin Costner is known for: “Never stop, never stop fighting till the fight is done.” – The Untouchables, “I will make you no promises, save one. That if you truly believe in your hearts that you are free, then I say we can win.” – Robin Hood: Prince of Thieves, “Never **** with a winning steak,” – Bull Durham, “Let justice be done, though the heavens fall.” – JFK (an old phrase, but he is known for it in film), “Greatness courts failure.” – Tin Cup, and finally, “Hey, Dad? You wanna have a catch?” – Field of Dreams. But like I said, that should not define an actor’s career. Tommy Lee Jones is a great actor, and I love almost all of his roles. But I feel Costner is better. You can disagree…fine. But I can also disagree with your opinion that ANY of the roles for which Kevin Costner is known could have been played by other actors with similar or better results. Thank you for replying. This is the fun part of being involved with these forums. Everybody has an opinion. I agree that a great line shouldn’t define a career, and it is difficult to know if a line was scripted or not, so I won’t pursue that line of thinking any more. Let’s just agree that both Costner and Jones are great actors AND that everybody has a personal preference in regards to acting abilities. We agree 100%. And I do honestly think Gary Oldman has a lot of talent like both of them, but he also sometimes takes a back seat in movies like this. But all three of them are among my favorites. I think Tommy Lee Jones has the better acting career. More consistently good films over a longer period of time. Kevin Costner’s career basically went dead after Waterworld.